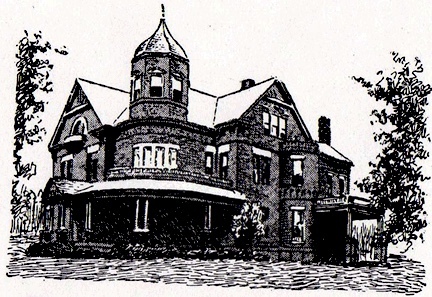 This early drawing of the McGee home, later the Rochambeau Hotel, is one of the few publicly-available images of the important mansion that stood at 37th and Broadway, near the site of the current Uptown Theater. Built by Kansas City pioneer A.B.H. McGee in 1886, the home changed ownership before opening as a luxury family hotel around 1915. It was destroyed by an arson fire in 1932. On a block of Broadway known today as home of the Uptown Theater, the history of a home-turned-posh-residential-hotel has nearly faded from history. The Rochambeau, once the home of Valentine and Roanoke neighborhood “father” A.B.H. McGee, was called one of Kansas City’s finest luxury hotels. However, a fire in the 1930s has erased it from most people’s memory. 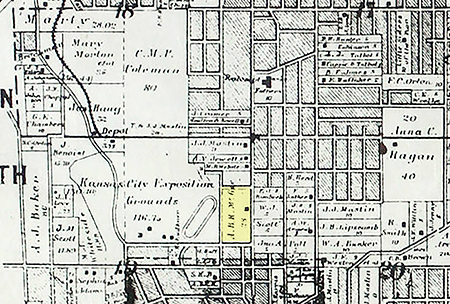 This 1887 Edwards map of property ownership shows the McGee home standing alone on its block. (The McGee tract is highlighted in yellow). To the west, McGee and others operated an exposition ground and racetrack (see on the map as a large oval). Local legend has it that the curve of the racetrack later became the curve of Valentine Road, although The Midtown KC Post has never been able to confirm that. Many Kansas City pioneers in the late 1800s lived on farms on large tracts of land. One of these was noted Indian trader A.B.H. McGee, whose father James was one of the first white settlers in Jackson County. A.B.H. built his country home on 130 acres extending from Broadway to Roanoke Road between 36th and 38th. The large tract was broken up in 1882, when McGee and a group of investors opened the Kansas City Exposition Grounds on the western portion of his property, now parts of the Valentine and Roanoke neighborhoods. The fairgrounds drew large crowds for annual celebrations and horseracing events. By 1887, however, the property’s value for booming south side expansion was so great that the owners could not resist the temptation to sell it – for 15 times its value just five years earlier. This 1907 Tuttle and Pike map shows the home, then owned by W.C. Sparks and surrounded by property still held by McGee’s daughter Nellie Nelson. By 1886, during a building boom that saw many wealthy area residents replacing their farms with new mansions, McGee joined the trend. He built a three-story home with a turret and bay windows “like a Norman chateau.” The home stood ten or twelve feet above Broadway, reached by a broad flight of steps that climbed up to a terraced lawn. At the time, the McGee’s had few neighbors along Broadway, which was not a commercial street but the site of fashionable large residences. Development in the area speeded up when a steam dummy line began running from Linwood and Main out Broadway to 39th and Mellier Place. Sometime around the turn of the century, the McGee family moved from the three-story mansion. By 1907, a map shows much of the block still under the control of McGee’s daughter Nellie Nelson. A horse and mule dealer named W.C. Sparks, however, owned the big brick mansion in the first decade of the 20th century. He and his brother operated the Sparks Brothers Mule and Horse Company in Kansas City from 1884 until moving it to St. Louis in 1909. The Sparks family moved out of the brick mansion in 1916, and that’s when it reopened, remodeled and enlarged, as the Rochambeau family hotel. The mansion and a new four-story brick building contained 75 rooms and suites. During the first World War, many of Kansas City’s elite families moved in and the Rochambeau became known as the most exclusive residential hotel of its day. Even as development began on Broadway in the mid 1920s and residential buildings were replaced by shops, theaters, and commercial buildings, the Rochambeau held on, retaining its feel of a comforting residence. “In spite of the modernity and smart appointments, the hospitality and comfort of an old southern home seemed to abide with the Rochambeau – so much so, in fact, that no guest ever left for another domicile without genuine regret, a feeling akin to the breaking of home ties,” the Kansas City Star said on Oct. 26, 1930. 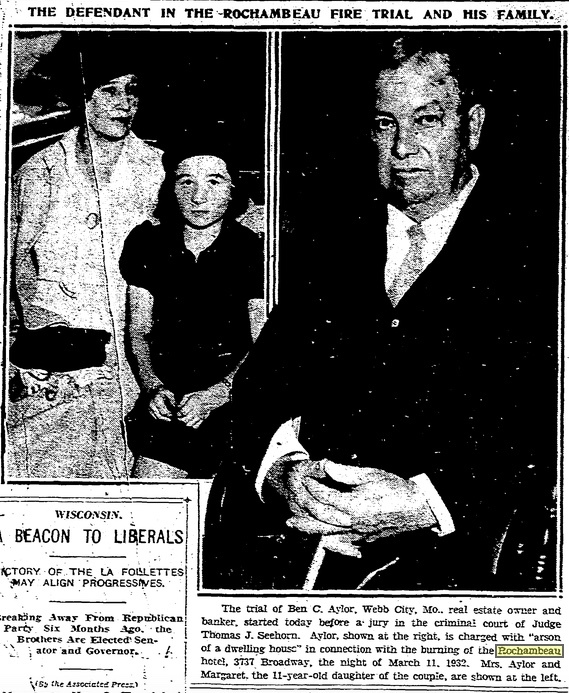 Nov. 7, 1934 Kansas City Star. By 1932, the Rochambeau had fallen on harder times. It had been closed for a year when owner Ben Aylor of Webb City, Mo. leased it to hotel operator H.H. Souders. Souders was in the process of remodeling and refurnishing the hotel when it was destroyed by a fire in March of that year. Authorities immediately suspected arson. Later in 1932, Aylor razed the charred building and graded the property to be level with Broadway. Two years later he had leased the site to the Uptown Theater for parking. That same year, Aylor and two other men were charged with arson in the Rochambeau fire. He was acquitted in one court, but another case required him to repay the insurance money he had received after the fire.